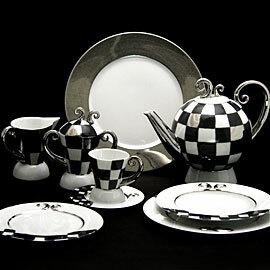 The series manufactured out of high quality bone china is handmade, hand-painted and dishwasher safe. 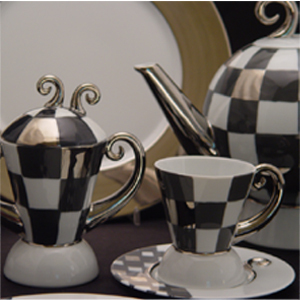 Decors applied under the glaze, using a painting technique developed by the artist herself, are refined over the glaze with high percentage polished gold and platinum. The genuine, handcrafted quality is proven by slight variations and distinctions, which make each piece unique. Barbara Flugel.